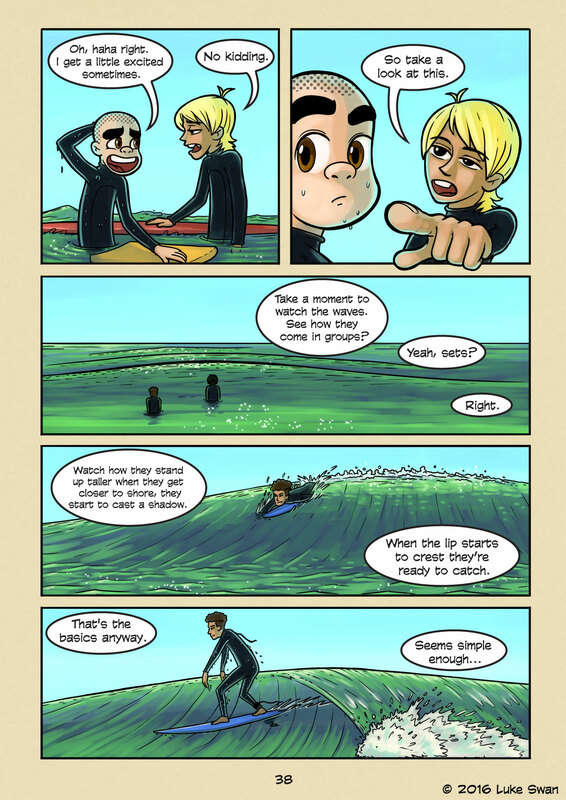 Wave Basics (#038) | Web comic "Surfer Joe"
There’s a lot that goes into making good waves. Waves are created by the wind, which comes from storms out at sea. The waves start moving towards land. These waves are called “swell trains”. If you look at a cross section of a swell train it looks much like those sound wave diagrams from your high school science textbooks. When they reach land, they no longer have anywhere to go, so they stack closer together and get taller until they crash, or “break”. Once they get to the beach there are still a number of things that can affect the waves. Is there any wind? How strong is it and which direction is it coming from? If the wind is coming from out to see it can make the seas choppy and the surf difficult. If it’s blowing towards the sea then it can flatten the waves out(or smooth them out if the swell is big enough). But when you are starting out these things matter little. In this page, I tried the distill the wave down to its very basics. What you see when they are arriving, and what a catchable wave looks like. Hopefully, it can help people who are taking on this difficult but rewarding pass time.